Oil on canvas, 104 x 76 cm. In this painting, Wilhelm Marstrand has portrayed Vilhelmine Heise, sister to Johannes Hage, the founder of The Nivaagaard Collection. Standing with one supporting hand on the table, the 15-year-old Vilhelmine glances shyly at the viewer with the slightest hint of a smile. She has black ringlets in her hair and is wearing a formal black silk dress with a white collar and matching red ribbon. 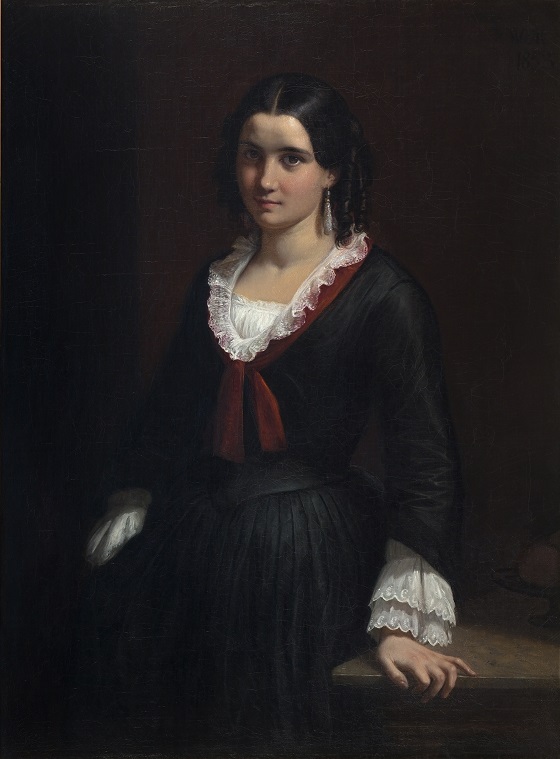 After Marstrand’s stay in Rome, practicing his skills in portraying young and beautiful Italian women, the painting of the equally young and beautiful Vilhelmine became an excellent opportunity to demonstrate what he had learned during his travels abroad. The artist was very dissatisfied with the end result of the portrait, however, and in 1856 he painted yet another portrait of Ville because he regarded his first attempt as imperfect.